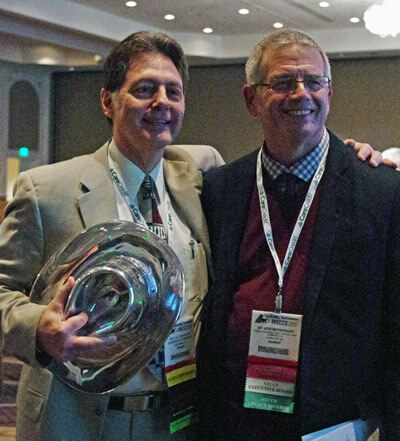 Tony Mann, a professor at MU’s College of Veterinary Medicine (CVM), received the Ira M. Zaslow Distinguished Service Award from the Veterinary Emergency and Critical Care Society (VECCS) on Sept. 14, at the society’s international symposium in Nashville, Tennessee. Bob Messenger, DVM, president of the Veterinary Emergency and Critical Care Society, congratulates the CVM’s Tony Mann on receiving the Ira M. Zaslow Distinguished Service Award. The award is the highest honor the VECCS bestows, and is given annually to an individual demonstrating extraordinary commitment and exceptional contribution, to both the specialty of emergency and critical care and to the VECCS. The award is named for Ira M. Zaslow, one of the founding fathers of the VECCS and the American College of Veterinary Emergency and Critical Care (ACVECC). “Recipients of the Zaslow Distinguished Service Award are legends in veterinary emergency and critical care who have paved the path for others, like myself, to become better practitioners in ECC,” says Ken Yagi, recording secretary of the VECCS Board of Directors. “Dr. Mann’s involvement in VECCS centers on his dedication to the scientific abstracts session. The session focuses on creating a stage for veterinary ECC practitioners to present their newest research findings, which moves us forward in elevating our practices. These sessions nurture residents and future leaders in advancing and spreading the knowledge and evidence we incorporate into daily practice. Dr. Mann’s efforts exemplify the commitment to steady work on the foundations of our field to better patient care. “Dr. Mann is one of those people who I look up to, someone who continues to inspire many of us to reach new heights,” said Yagi, a registered veterinary technician in California who earned a master’s degree in biomedical sciences from the MU CVM. Yagi received Outstanding Technician of the Year recognition from the California Veterinary Medical Association in 2016 and Technician of the Year honors from the National Association of Veterinary Technicians in America this year. Mann’s influence in the field has a long reach. Last September, Konkuk University in South Korea launched a new emergency and critical care program. Doctors Hyun-Jung Han and Hun-Young Yoon enjoy a collegial relationship with Mann. They view his influence as so prevalent, they invited him to participate in the opening ceremonies, although his schedule limited his contribution to a congratulatory video. Hun-Young Yoon, DVM, MS, PhD, is a co-author of Mann’s formative 2011 book, Fundamentals of Small Animal Surgery, along with the CVM’s Gheorghe M. Constantinescu, DVM, PhD, a professor emeritus of veterinary anatomy and medical illustrator in the Department of Biomedical Sciences. Mann, DVM, MS, has served as president of the ACVECC and was the organization’s ombudsman from 2009 to 2017. He is director of the Veterinary Heath Center’s Small Animal Emergency and Critical Care Service and works as both a critical care specialist and soft tissue surgeon. Mann is a diplomate of the American College of Veterinary Surgeons and the American College of Veterinary Emergency and Critical Care. A native of Kentucky, Mann joined the CVM in 1988. He received a doctor of veterinary medicine from the Ohio State University in 1982 and completed a small animal medicine and surgery rotating internship at MU the following year. He then completed a small animal surgical residency and received a master of science degree in veterinary medicine and surgery at Texas A&M University. Mann also served as an assistant professor in small animal surgery at Auburn University from 1986 to 1988. The IVECCS is known as an intense clinical symposium offering continuing education, including lectures, dry labs, workshops, wet labs and interactive training sessions. The symposium attracts clinical veterinarians, technicians and practice managers from around the world, and features information about the latest advances in equipment, instruments, pharmaceuticals, and information management tools in the field. Mann has attended every IVECCS, except for the first one in 1988, and has served official duties at many of them. Examples of service that contributed to Mann’s selection for the Zaslow Award include being a past member of the VECCS Board of Directors, coordinating the IVECCS Small Animal Abstracts program since 1998, and conducting a successful limited enrollment laboratory at the IVECCS since 2006.